Twelve year-old girls should be planning slumber parties, or dreaming about what they want to be when they grow up. Twelve year-old girls should not be worrying about marriage. The country of Bangladesh—with more than one-quarter of it’s population living on less than $2/day—can be a difficult place to grow up. But 11-year-old Dina is a light to her destitute homeland. 11-year-old Dina was on the path towards child marriage before getting a scholarship. Dina was born into a very poor family in a rural community and until recently, her life was going down a seemingly dismal path. Like most young girls in her community who spend their days working for their families—cooking, cleaning, fetching water and taking care of younger siblings—Dina was soon to be married. Educating girls in places like Bangladesh drastically reduces the likelihood of them becoming child brides and teenage mothers. After talking with Dina and later meeting with her parents and telling them about an opportunity for her to attend school on a paid scholarship through World Concern, the teacher was able to re-direct Dina’s path completely. Today, Dina is the top student in her fourth grade class. “Without your assistance, it was not possible for us to send Dina to school and lead her on a track of development to a brighter future,” Dina’s parents explain. Ultra poor women like Faranza are becoming empowered through their involvement in micro-credit programs in Bangladesh. Families around Bangladesh are learning about the importance of sending their children to school. In a male-dominated society that does not traditionally support education for girls, this is a vital step in the right direction. In the past month alone, 60 new households heard about the scholarship program for the first time and 92 sponsored students had their tuition and exam fees paid for. As a direct result, there has been an increase in overall school attendance as well as major improvements in the way that parents are prioritizing and taking better care of their daughters. As parents are seeing the impact of education on their children’s lives, they too are becoming motivated to learn and improve their own lives. For women like Dina’s mom, this means getting involved in a women’s micro-credit group. These groups allow women to work together and save money as well as invest in their own small businesses. Not only does this directly impact their economic stability, but it empowers them to stand up for their rights and learn new skills such as how to read and write. In one community this month, advocacy and counselling sessions helped prevent a divorce and two child marriages! To help more girls like Dina become lights in their communities, you can provide a scholarship for $50 and send a girl to school today! When Karima was just 8 years-old, her father left. And she took it hard. She had not lived a day without him by her side. This man had protected her, and worked to keep her in school. So when he abandoned her mother and two sisters, Karima’s world came crashing down. Nobody came to console her. Nobody was there to wipe away her tears. 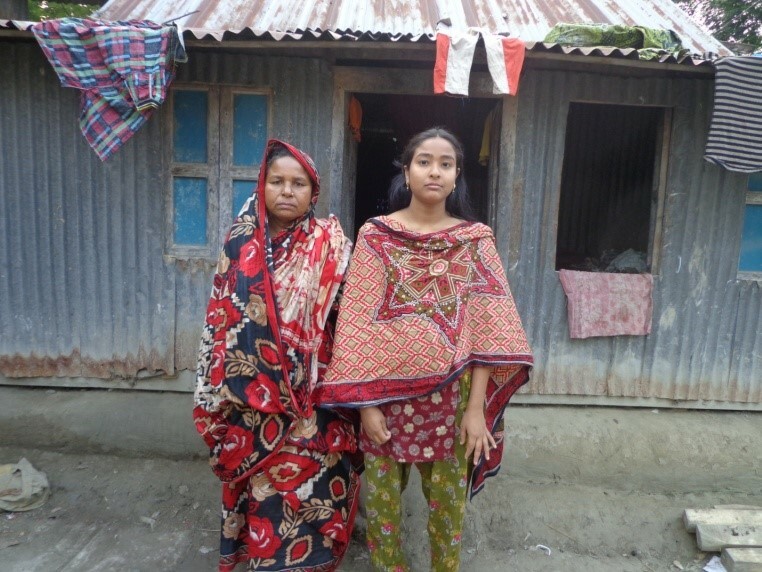 Karima (right) stands with her mom outside their home. And sadly things would only get worse. Karima’s village is in Bangladesh, and while she was too young to know it, it’s a country where many young girls are married off as child brides. Bangladesh has the fourth highest rate of child marriage in the world, where 1 in every 5 girls is married before they turn 15. Mired in poverty after her husband left, Karima’s mother managed to survive in a small dilapidated shack, no bigger than your average kitchen. She fiercely protected Karima, and fought to keep her in school, knowing that an education was the only thing that would help her escape this life. So she did what any mother would—she worked to find a way. But with no money, and never having worked before, it was close to impossible. She finally found a day laboring job but the wage was small, barely enough to pay for food. There were days when the family would go without just so Karima could stay in school. It was an overwhelming sacrifice and money was quickly running out. In Bangladesh, stories like this are far too common. In this article, a 15-year-old child bride sadly reflects on her situation saying, “We were very poor. Sometimes we would eat every two or three days,” she says. “Even though they [parents] really wanted all three of their daughter to study, it wasn’t possible –so they got me married.” Her older sisters married at 11 and 12. With her scholarship, Karima hopes to finish school and become a teacher. So for Karima’s mother, it was no surprise when a friend suggested her daughter be married off as a child bride. This is the shocking reality for girls like Karima. They have no say, no choice. Their only hope of avoiding this terrifying prospect is to stay in school. At World Concern, we consider every child precious. And for that reason we’re focusing our efforts on preventing girls like Karima from becoming child brides, by doing all we can to keep them in school. We do this by providing scholarships for girls like Karima. The scholarship gives them an education and keeps them from being married off too young. And a scholarship only costs $50… for an entire year! Please pray for girls like Karima, and for their brighter futures. Have you seen the 2017 Global Gift Guide yet? One of the more popular items are goats, and for good reason. 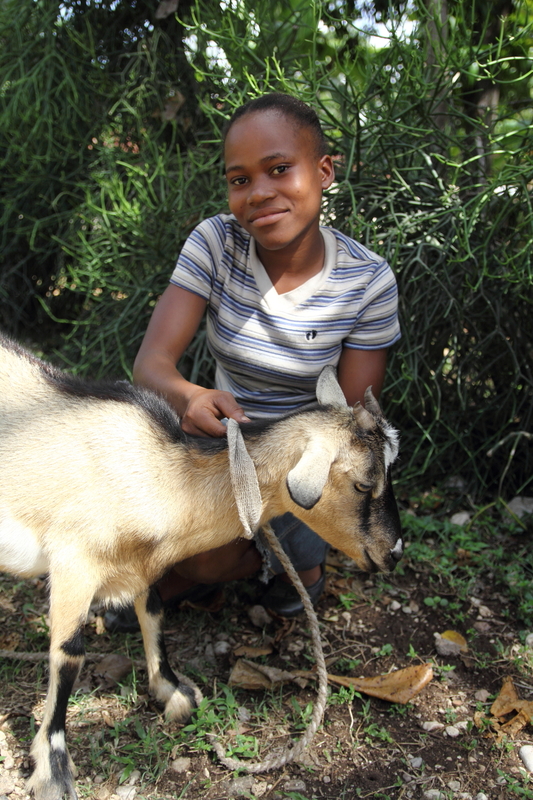 Read about a young girl in Haiti named Fania to find out why the gift of a goat means she’ll get to stay in school. In the rural community of Mersan in southern Haiti there is a primary school called Ecole Mixte Bon Berger. Since 2012 World Concern has partnered with this school by providing goats and husbandry training to students. With a goat, students are able to earn an income by selling the goat’s offspring and using the money to pay for school tuition and other supplies. Fania received a goat from World Concern and participated in the training where she learned how to take care of her goat and how to maintain its health. Now her goat is in heat and Fania expects it to become pregnant shortly. When working with communities, the ‘long view’ must be taken into consideration. There may be solutions that would provide temporary assistance to Fania, however this lacks sustainability and requires a handout to be given repeatedly. World Concern is interested instead in long term solutions. 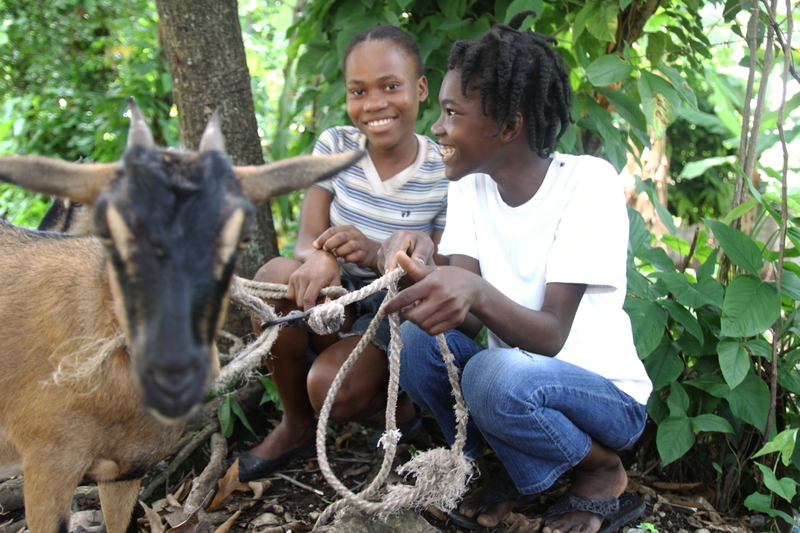 A goat is a treasured asset in rural Haiti because it represents a steady income. “Each year a goat can give between six and nine kids, and she may produce kids for up to 10 years,” explains Pierre Duclona, World Concern’s regional coordinator for southern Haiti. While a goat and relevant training may not produce immediate results, it will provide students like Fania with a way to earn an income for years to come and give her new skills which she can carry into adulthood. Fania will soon begin the 6th grade and is looking forward to returning to class after the summer break. With a goat and specific training, Fania is well-positioned to earn an income and therefore continue with her education which will give her opportunities to provide for herself and her family. It is because of your generosity and partnership that we’re able to help keep girls like Fania in school! Give the gift of a goat today. Although we’ve been taught that there is no “silver bullet” to combating poverty, education may be an exception. The impact education can have in the lives of children—especially girls—is overwhelming. – One extra year of school boosts a girl’s future wages by 10-20 percent. – A girl who completes basic education is three times less likely to contract HIV. – Education drastically reduces child marriage. On average, a girl with 7 years of education will marry 4 years later and have 2.2 fewer children. If statistics are not convincing, listen to girls themselves. I’ve found that in Haiti girls yearn to attend school and know full well the value of an education. “School is important because you need to learn things so you can have an occupation,” said 12-year-old Rocheka who lives in the small coastal village of Crabier in southern Haiti. So what’s with the goats we talk so much about? And what do goats have to with education? Well I’m glad you asked. In partnership with schools and churches, World Concern gives a female goat to a young girl who also receives basic goat husbandry training so she knows how to take care of her goat. Once the goat has babies (called kids; funny but totally legit), the first kid is given back to the program so another child can benefit. Then all other kids that the female goat gives birth to can be sold by the girl to pay for school fees and other related costs such as books, materials and uniforms. This way the girl is given a skill (goat-raising) and she is able to contribute towards her education, reducing dependency and making her an active participant instead of a passive receiver. 1. Life lessons. When a goat is initially given to a girl, she also receives basic goat husbandry training. The training focuses on how to feed the goat and keep it healthy. 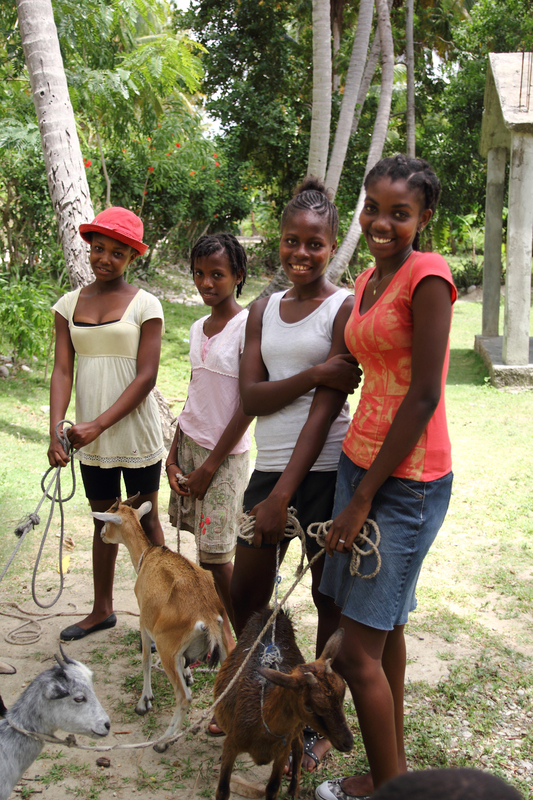 A goat is an asset in rural Haiti and represents an important source of income that girls can use to pay for school fees and other necessities. It’s important from the beginning to give girls the skills they need to take care of the goat. The goat husbandry knowledge they gain during the training is something they can use for years to come, even after they finish school. Since a goat requires consistent attention, girls learn important life lessons such as responsibility, discipline and ownership. Aside from the initial training, World Concern staff returns each month to teach girls and other students about additional tips and techniques for raising their goat. 2. “Multiplying effect.” When a goat is given, its impact goes beyond the girl who initially received the goat. The first kid that goat produces is returned to the program so it can be given to another child. This is one reason that our goat program in Haiti has existed since 1998 and continues to this day. The gift of a goat has a significant impact in the life of a girl but it also is a gift that multiplies over time, impacting other children as well. 3. The gift that (literally) keeps giving. “Each year a goat will give between six and nine kids, and she typically can produce kids for up to 10 years,” explains Pierre, World Concern’s regional coordinator for southern Haiti. The kids that a goat produces represent income for a young girl so she can attend school and most importantly stay in school. All goats, minus the first, are hers to sell. Enabling a girl to earn an income and pay for school lightens the financial burden on her family and allows the family’s precious resources to be spent on other critical needs. World Concern provides vaccinations to goats in the program as well as on-going veterinary care. This ensures that the investment of a goat will truly benefit a girl long term. Rocheka (second from left) and friends outside their church in Crabier. 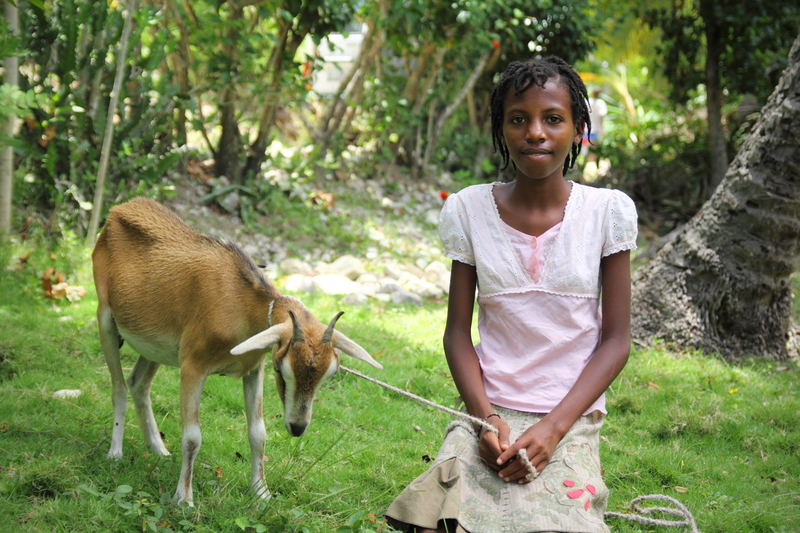 Rocheka is one of many girls in Haiti who are able to stay in school thanks to the gift of a goat. Rocheka is a soft spoken yet determined and bright girl who has big dreams. “After I finish secondary school, I would like to be a nurse so I can take care of children because many children suffer from disease,” she shared. Youslie is a 7-year-old girl who lives in the village of Guilgeau and is currently in the second grade. “In school I like to read stories,” she said. Youslie recently received her goat and is enjoying taking care of it. Youslie (left) and her friend Belony in Guilgeau. In Haitian Creole, the language spoken by all Haitians, the word baton is significant. Translated directly it means ‘stick’ or ‘baton’ however it has a deeper meaning. A baton can also be a skill or ability that a person possesses which will help them succeed in life. This meaning is often used in reference to education. Following earning a certificate from a trade school or graduating from high school, someone may say, “Now I have a baton I can use to fight in life.” With a baton, a person is given a tool which will help them in their pursuit of a more healthy and productive life. In Haiti, girls face many challenges which leave them vulnerable—generational poverty, limited financial resources and lack of opportunity. At World Concern, we want to give girls a baton that will help carry them through some of these challenges. Education is one baton that has a long-term impact on the life of a young girl. 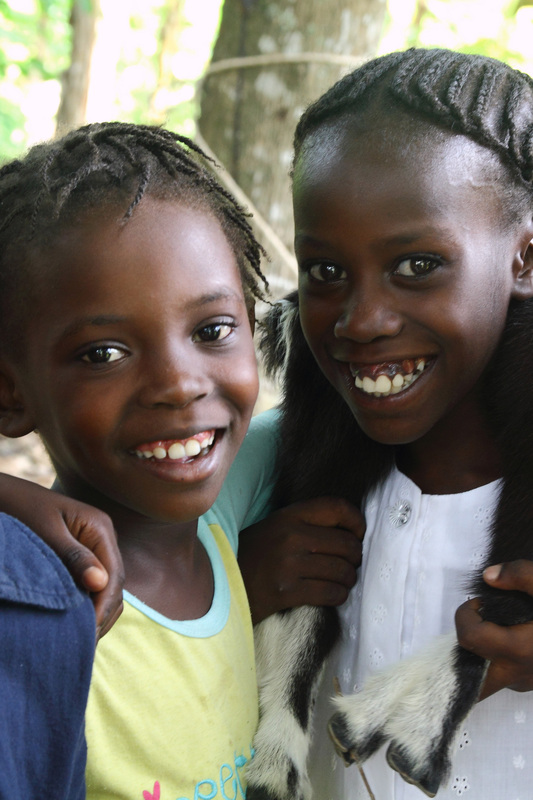 Girls like Rocheka and Youslie are the future of Haiti. Helping them stay in school is an investment in their life but also has an impact on their family, community and country. 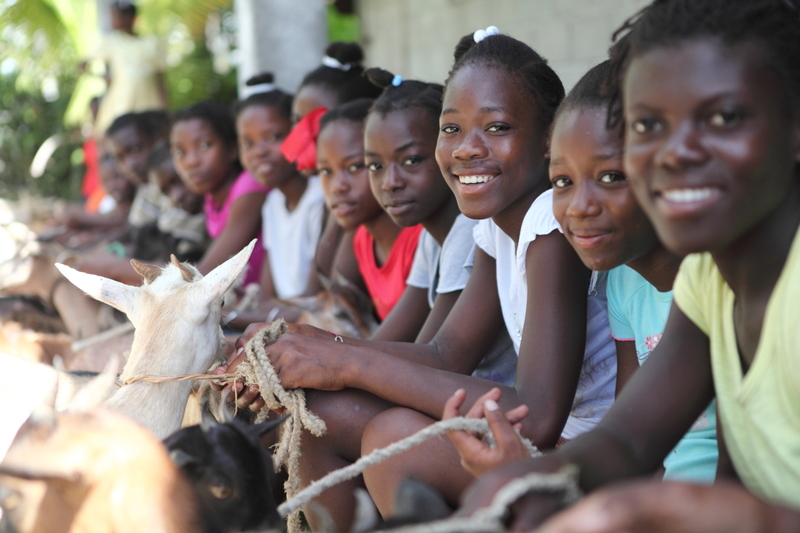 Help us impact more girls in Haiti by giving the gift of a goat today! The following is an excerpt of a letter we received from a 20-year-old woman. She enclosed a fifty dollar bill to help educate a young girl in a poor country. It touched our hearts to hear how she was able to put herself in Jovia’s shoes, and to see how God uses people to help transform the lives of those in need. I received your letter about this 14-year-old girl named Jovia. I was touched by your letter and I was shocked to see that these girls are getting married at such a young age. I cannot imagine being married at my age, which is 20, let alone 14! My heart goes out to these young girls. I received my paycheck at work and discovered I had less hours this week. I wanted to give to Jovia and her cause, but was struggling with how I was going to make it work. I was really praying about it and I didn’t know what to do, so I set the letter aside. I read those verses and paused. Memories of my high school years filled my mind. There were so many fun, exciting, embarrassing, sad, and interesting situations that I had growing up. I have some of the most lasting friendships from high school. I know Jovia would love to continue having those experiences and friendships in her teen life. Those are what start to mold us into who we are today. So to get married right off the bat so young would be missing out on a part of your life that has not been fulfilled. I glanced around my room and saw all the beautiful luxuries I had compared to Jovia. I have a comfortable bed with a pretty bed spread, sturdy furniture, many nice clothes, purple painted walls, and carpeting. I know I am blessed, and to read about this girl who doesn’t have anything close to that, and her only hope is for her dream of attending school this year to come true. Click here if you’d like to provide a year of school for a young girl like Jovai for $50. Malala Yousafzai’s tragic experience of being shot for her advocacy of girls’ rights has brought much attention to the importance of and need for girls’ education worldwide. As Malala celebrates her 16th birthday with a visit to the UN, all eyes are on the world’s response. Will we simply talk about the importance of educating girls? Or will we do something? Christine was the only girl in her class in secondary school in rural Kenya. Now, she’s a role model for other girls in her community to pursue their education. When I think of the incredible challenges faced by girls in developing countries to pursue an education, I think of girls like Christine. Unlike most girls her age, Christine is one of the few in her rural Kenyan community to complete her education. Throughout secondary school, she was the only girl in her class. “It was difficult,” she said. In this part of the world, most girls her age are either married off young—some as young as 10-years-old—or cannot afford to pay school fees. When finances are tight, parents tend to pay for their sons to go to school, rather than daughters. World Concern provides scholarships for girls like Christine to finish school. Because she did not marry young, Christine and her family were ridiculed by others for their decision to pursue education. She found it hard to relate to her friends. But this never weakened her determination. A young girl studying in Bangladesh. Christine is now a role model for girls in her community. Ms. Warabi has taken a special interest in one of her teen students named Agnes, who was already married and pregnant when she came to the school. She gave birth while living at the school, but has been able to continue her studies. “She’s performing well,” said Ms. Warabi. The situation in places like Haiti is critical too. Crushing poverty keeps many girls from attending school, and even fewer from completing their education. It is especially important to support girls in their pursuit of education. According to UNICEF, only 52% of girls in Haiti participate in primary school and the number drops to 21% in secondary. The need is obvious, and the solution is simple. Not only does an education provide increased social and economic opportunities for a girl but it helps break the cycle of poverty in her family and community. After finishing high school, Manoucha hopes to become a nurse so she can help others in her rural village in Haiti. Manoucha is 19 years old but still has a couple of years left of high school. “I like to go to school but I have lost some years because I was sick,” explained Manoucha. World Concern is helping Manoucha finish her education. In Haiti, we do this by providing young people like her a way to earn income and pay school fees. Manoucha received a goat and training on how to care for her goat. Her goat’s first baby was returned to the program so it can be given to another child. This way, the program can sustain itself and kids are able to learn a skill and are given ownership. A young girl works hard in her classroom in Laos. You can help a girl like Christine or Manoucha finish her education, pursue her dreams and change the future of her entire community. As we stand in awe of Malala’s courage today, let’s help her celebrate this milestone birthday by taking action. Click here to give the gift of education to a girl in need. $50 provides an entire year of schooling in a poor community.